When Kerry took on Meath in the 2017 junior All-Ireland final, the Kingdom management knew they had a couple of trump cards in their full-forward line. In Conor Cox and Tomás Ó Sé, they knew they had players with a big future. Cox had been knocking about the Kerry senior panel under Eamonn Fitzmaurice while Ó Sé was among a spate of talented graduates from successful Kerry minor teams. Between them the pair would get 2-10 on the day, just a point less than Meath's total of 1-14, enough to secure the county's third junior title on the bounce. Tomorrow, Kerry's terrible twins of that day will find themselves on the opposite sides of the divide after Cox's switch to Roscommon. "He was one of our main forwards all right," recalls Jimmy Keane, who managed Kerry that day. "It's ironic but Tomás Ó Sé was inside with him in that full-forward line and he's making a bit of a name for himself with the (Kerry) seniors. "He came on against Galway and did very well for himself and against Mayo so the two of them would have played together. But Conor was a great target man inside and the day of the final against Meath in '17 he got 1-8 in total, 1-5 from play." Ironically, the last of Cox's seven league games with Kerry was when Roscommon defeated them in Killarney before he moved to the Connacht side earlier this year. The switch wasn't straightforward. He originally transferred to his father Martin's home club, Éire Óg, late last year. But to be eligible to play with the Rossies he needed to have played a championship game with the club first. With the Roscommon club championship not due to get under way until much later in the year, that would have ruled him out for this year. A move to St Jude's in Dublin also fell through. 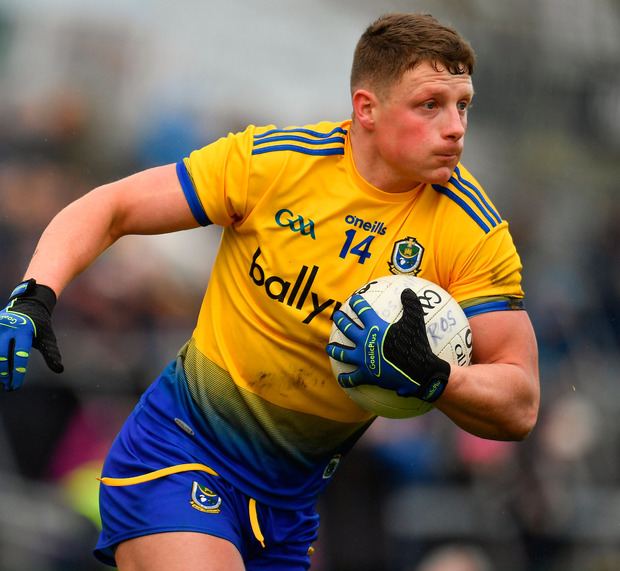 It was a switch back to his native Listowel Emmets that paved the way for his Roscommon debut - he didn't actually need to leave Listowel due to the 'other relevant connection' to a county rule - where he scored five points, including a vital late free. "I'm delighted for him, he's a brilliant prospect," Roscommon manager Anthony Cunningham said afterwards. "We're delighted to have him. His father will be a proud man tonight. It's the start of a long career for him and hopefully we'll see many more days like that from him." Cox has top-scored for Roscommon with 1-21 from five games to date, including some spectacular scores. Against Tyrone, his marker was called ashore before the half-hour mark. "I have just seen the few clips on TV but I'm not surprised at how he is going," Keane added. "When he is playing against the other inter-county teams they might not be aware of Conor and his ability. "Down here we all know what he's like but maybe in Roscommon there are plenty of people who didn't know of him or his ability, never mind when he's playing against other teams who wouldn't be aware of who this man is, but I'm not one bit surprised at what he has achieved so far." "There'd be an added bit of pressure (playing Kerry) because he is playing against a lot of fellas he would know. "Added to that he won't have the surprise factor against the Kerry boys because they'll know his ability and reputation in Kerry." Keane is still in charge of the Kerry juniors, a team the county are using as a development squad, and they are going for five All-Ireland titles on the bounce this year. That record is a nod to the depth of talent in the county. "All these minors can't come on the seniors straight away so they have to get a stepping stone somewhere and in a way that's what Conor would have done too to an extent. "He didn't break into the Kerry senior stage after coming out of the U-21s and college but again you have to look at the forwards there at the time. "When he got a run in the league maybe around 2013, '14 or '15, you had Paul Geaney, James O'Donoghue and Kieran Donaghy in the full-forwards when they won the All Ireland. So it was very hard to break into that." Roscommon are surely delighted that he didn't.